Have you ever tried to figure out the public transportation system in Sofia? What to take, where to get a ticket, how to use it, how to get to the airport, train or bus stations? If so, you have come to the right place, because now we will introduce you to the public transport of Sofia and give you useful information on how to survive in the urban jungle. We hope it will help you “blend in” and not look like human on Mars when you get on a bus. So, hop on and let’s get started! Public transport exists in every good-sized city and Sofia is no exception. Although lots of Bulgarians prefer their cars to move around in the capital, there are people who still prefer to use the public means of transport. As a matter of fact, it is getting more popular and quite regular. Taking a ride in the Sofia public transport is a journey in space and time like no other and the only thing you need is just desire and a ticket. is considered to be dirty, crowded, smelly, late and ancient in terms of vehicles, but that’s increasingly less the case nowadays. The system started operating in the beginning of the 20th century with 6 tram lines serving the needs of the citizens (about 70 000), but with the rapid growth of the city – the population grew by about 25 times, while the territory more than quadrupled – soon there were a lot of people who needed ways to move around. In order to cope with the situation, new buses and trolleybuses were purchased and new lines were introduced and not long after that the metro project was initiated. The population of the capital continued to grow and at a certain point there were more people than public transport could serve, so it became crowded, dirty and smelly. To add to that, some of the vehicles had not been replaced for over 30 years and in the end people started to consider the system unreliable. All of that, however, changed with the course of time and the implementation of new technology, vehicles and lines so that today there is a vast and comparatively modern network of buses, trolleybuses, trams, metro and even a special Bulgarian invention called marshrutka. Before we continue, here is some basic information. 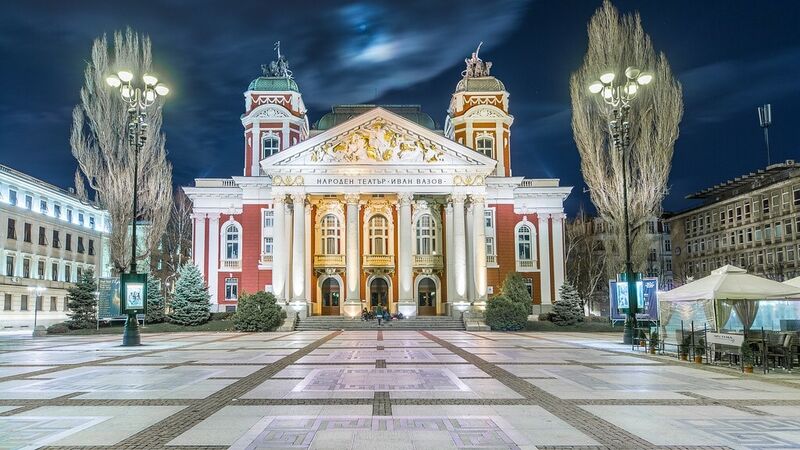 The public transport of Sofia starts to operate every day in 5:00 in the morning and finishes at 24:00. 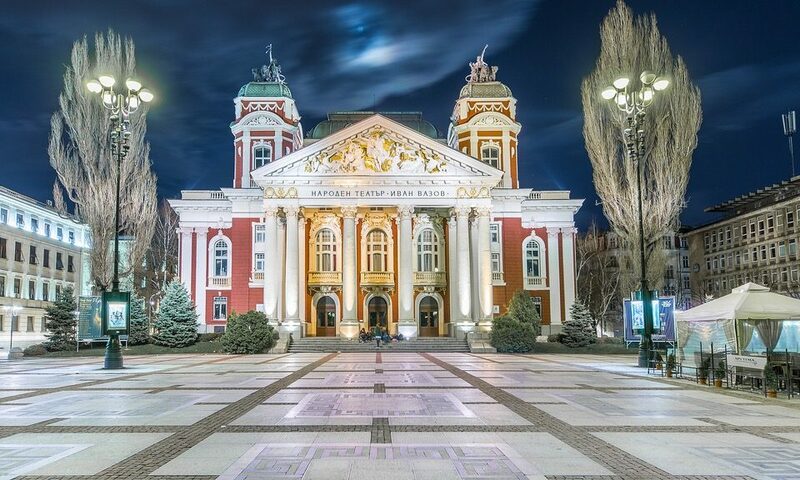 In April 2018 night transport started functioning in Sofia. On this site you can find detailed information about the whole network, itineraries and schedules. This mobile app is also really useful. It is where you can check the arrival time of your selected means of transport. To roam the urban jungle you have to buy a ticket and if you have with you a piece of luggage that takes up about as much space as another person, then you have to buy one extra for it as well. Generally with that ticket you can ride the trams, buses and trolleybuses. The ticket for the metro is different, but the price is the same. They are and have always been the optimal transport in the heart of the city since they are regular, fast and for the most part are unaffected by traffic jams. Last year new, fancy, high-tech trams were introduced to the capital with the purpose to change the oldest vehicles, but you can still see the old yellow trams, which have actually become a symbol of Sofia as it is the only city in Bulgaria with tram transport. They are wired just like trams, thus relatively restricted, but are still moving really smoothly. 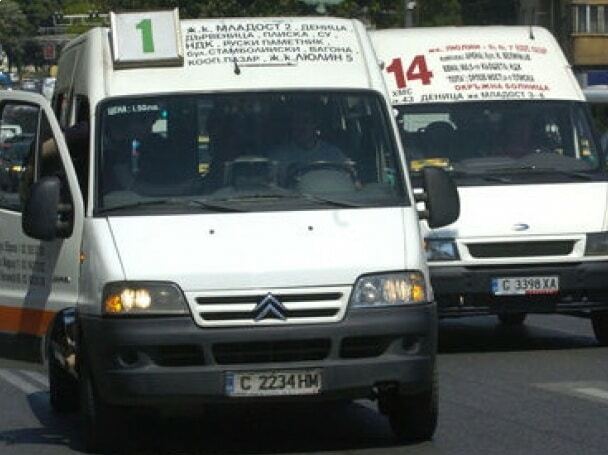 They are usually old blue-and-yellow Hungarian made “Ikarus” vehicles, but recently new ones have been introduced. Generally the most adventurous thing to happen on a journey in a trolleybuses is when its poles disconnect from the wires. It is a curious sight to observe the driver fighting to bring the huge machine back to life. These are the two lines that can take you from and to the airport, respectively Terminal 1 and Terminal 2. Line 84 will drop you downtown, whereas 384 makes a connection with the metro at Mladost 1 station. These two will take you to the Student’s city of Sofia (Studentski grad), a place that never sleeps. If you are either studying in one of the universities there or up for a party these lines are your best and cheapest way to get there. This is one of the most famous bus lines in the capital known by the “true locals”. 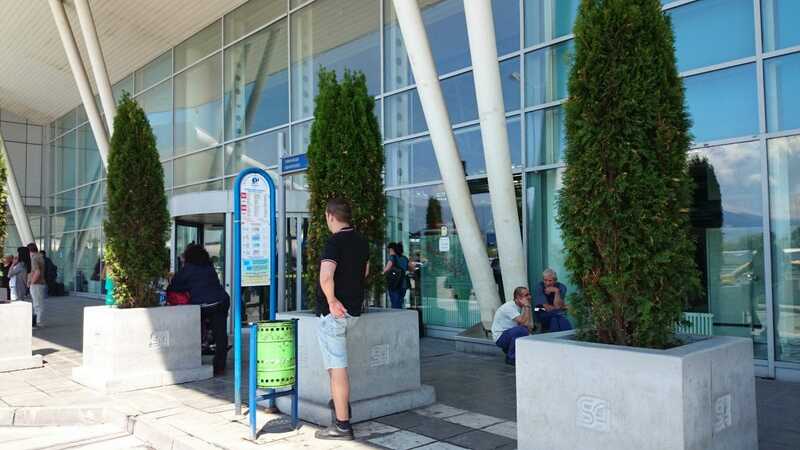 The line is really busy, because it also stops at important landmarks like the Military Hospital, the National Palace of Culture, the National Stadium and Pliska hotel. This line is directly linking the city center with the central bus and train stations and also makes a connection with one of the biggest and most populated neighborhoods of the capital, Mladost. 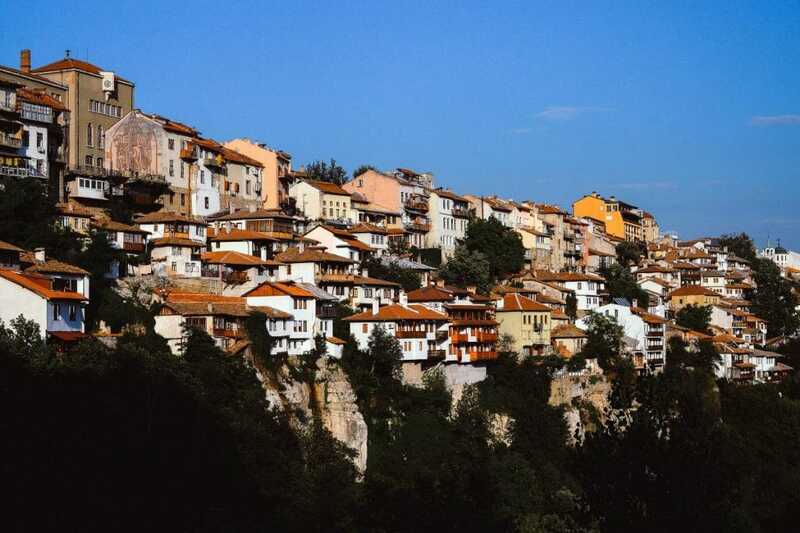 It goes to the Boyana neighborhood, where the National Museum of History is located. 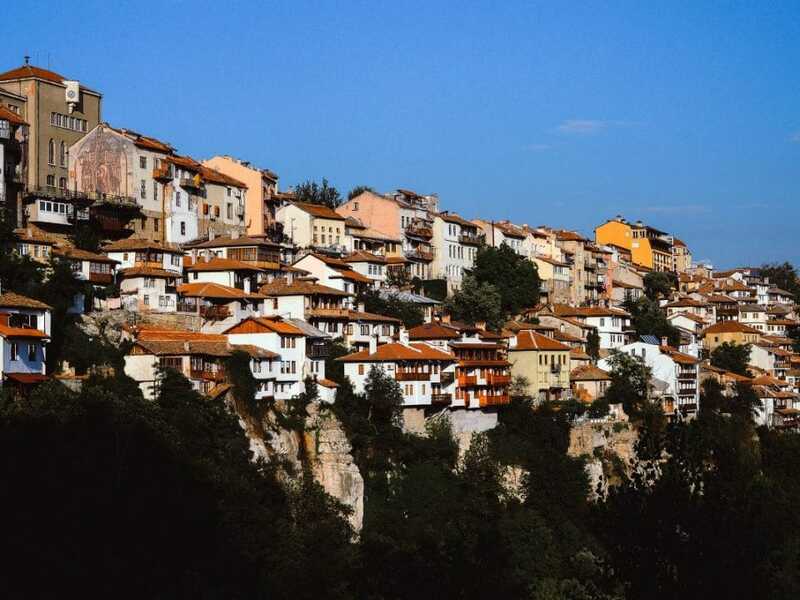 Also near it are the Boyana church, which is part of the UNESCO World Heritage list and a really beautiful waterfall (the Boyana waterfall). Riding to the last stop will take you in the foot of the Vitosha mountain, very close to the “Bay Krastyo” lift, which takes the four hour hike to the top of the mountain in just 20 minutes. It is really new, it started operating in 1998, but it has quickly become the favorite means of transportation for citizens. There are two lines, which are connected at the Serdica station. 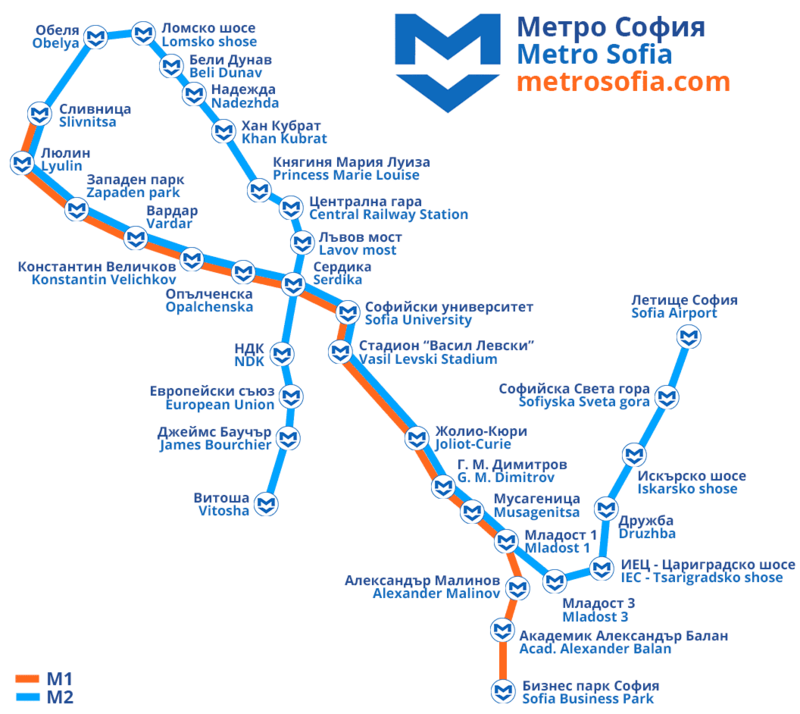 The metro also reaches Terminal 2 of Sofia Airport. There is a also a new line under construction. It is a local invention. Its name comes from the French words marche and route, literally meaning walking route. These are vans running through the city. This means of transportation became very popular at the beginning of the 90’s. At the time the public transport was comparatively unreliable, crowded and old-fashioned. Their lines correspond to the numbers they have and are based on the needs of citizens. This is also why they run the most popular routes like Student City to the Central Railway Station. The drivers are famous for their exceptionally erratic driving. They compensate through speed and being able to hop on and off on demand (they don’t have designated stops). The price of the ticket is 1.5 leva. 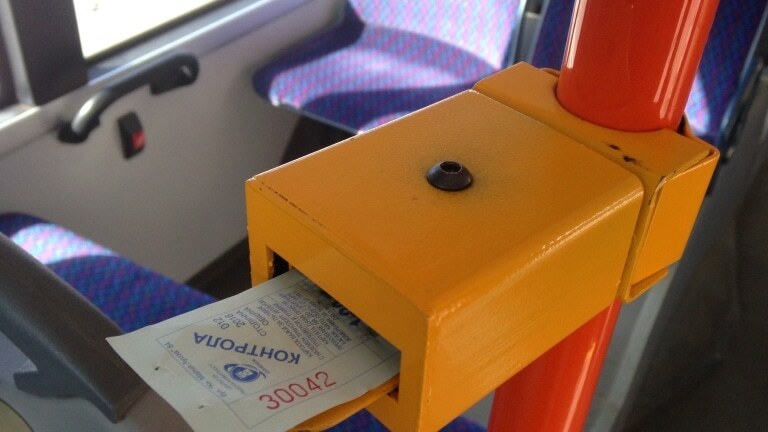 You hopefully already know that you need a ticket for the public transport. As a universal rule, one ride costs one ticket and one ticket costs 1,60 BGN. You can use it one-time only for the bus, tram or trolleybus. There are other options. One is a collection of numbered tickets that you need to use in the correct succession and always keep the first one. There are also monthly or yearly passes, but let’s not overcomplicate things. After you obtain a ticket you have to validate it by running it through one of the perforators in the public vehicles (see pictures). 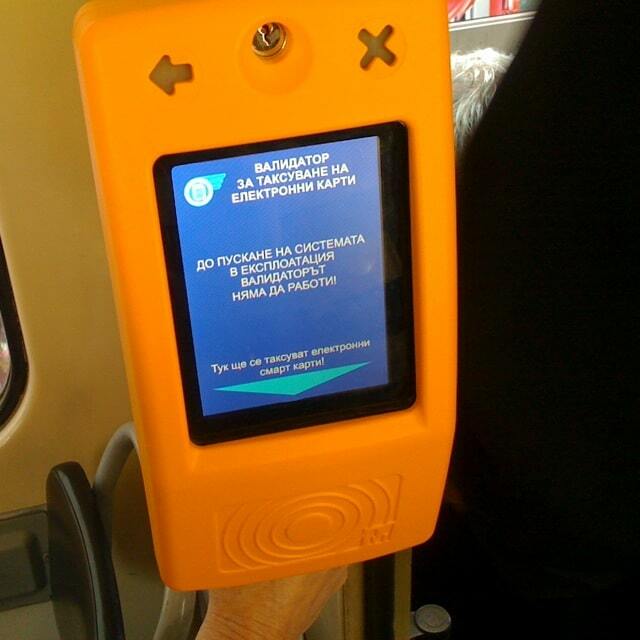 Usually there are at least 4-5 of these devices in every bus, tram or trolleybus. Be careful, each vehicle’s perforators leave a unique pattern of holes through your ticket, so you can’t re-use it. The system is primitive and old-fashioned, but it guarantees that you won’t use the ticket multiple times. Many of the vehicles are now also equipped with ticket-selling machines. They print tickets upon insertion of the correct amount of money (1,60 lev). These you do not need to perforate, as they have the date and time of purchase printed on them! The Urban Mobility Centre is putting a lot of effort to answer the needs of customers and keeps. It keeps in touch with the latest trends in technology. As a result it offers special preferences for travelling. 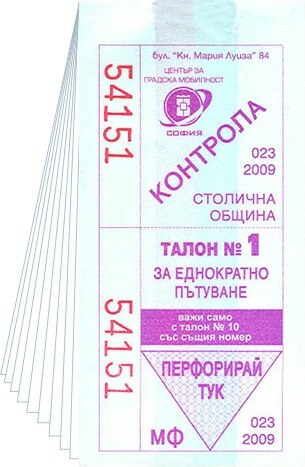 Apart from the normal ticket there are for example special tokens with 10 tickets for 12 leva. It would normally cost you more if you buy them separately. Every ticket from the token has a number (from 1 to 10). The tricky part is that in order to use them you always have to present ticket number 1 together with the one you are using for the trip. Also, two people cannot use tickets from the same token. There is also a day card that costs 4 BGN and you can use it as many times as you want on all public transport vehicles (including the metro). It is only valid during the day of purchase and it can only be used by 1 person. You can buy these from the ticket offices at some of the stations. Also at the offices of the Urban Mobility Centre. Otherwise you can buy a normal ticket from the driver. In most of the vehicles there are also vending machines, which you can use to buy a ticket. Drivers usually call them “piggy banks”, because they operate with coins. If you happen to stay for a bit longer, you might be interested in buying a monthly card. Now after you are familiar with most of the transport of Sofia, a logical question would be who controls everything and what happens if you don’t have a ticket? The answer is simple – you will meet The Controleurs. These are the people responsible for keeping the order in the public transport. They all have the same uniform and you can easily recognize them. If you dont have a ticket you will have to pay a 40 leva fine. We recommend that you are always prepared unless you want to pay that instead. This is the newest option provided by the Urban Mobility Center. 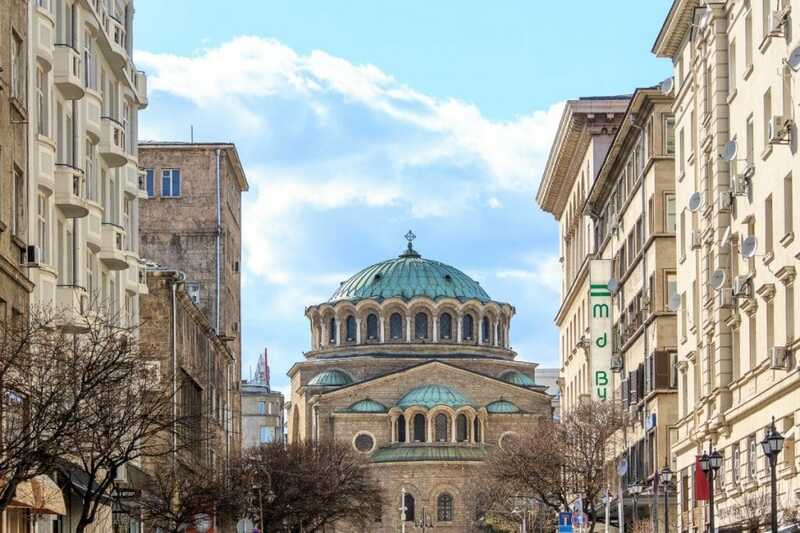 It is for those of you planning to spend just a few days in Sofia. 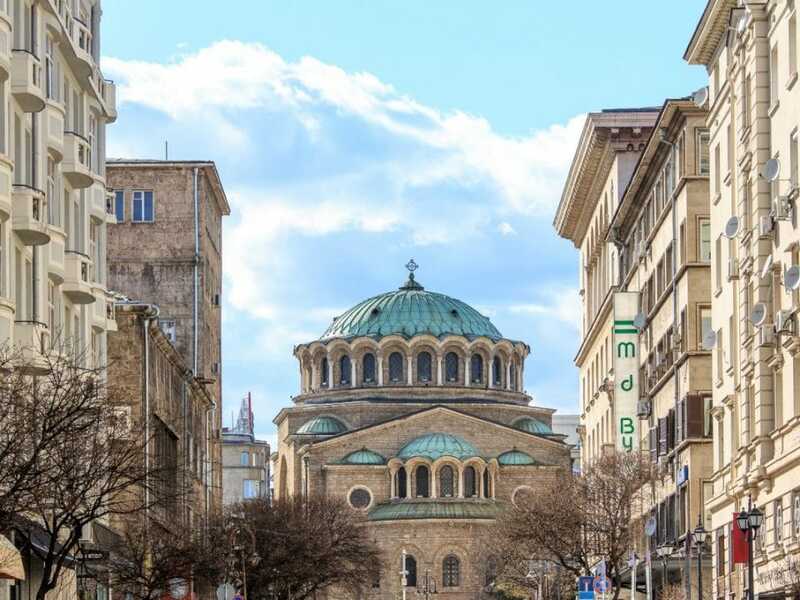 For the price of 20BGN (10 EUR) you’ll be able to use the entire public transport network for 3 days and get discounts at more than 60 sites around Sofia. You will also recieve a travel guide and a map. Taking a taxi in Sofia? What should we know? Can you help me with the tranportation from central bus station to Hristo Botev Hall. I need some help,I will arrive at the central bus station in Sofia.From there i will need to go to Hristo Botev Hall. Can anyone please help me,what transport should i use ? Where else in the town can I buy a single bus ticket, aside from the ticket machines in buses? Which bus, mimi bus or train goes from Railway station to New Bulgarian University? Thanks! I would like to know how to get from Sofia to Panichishte by public transport. We plan our holiday on second week of October this year and it seems to me that it’s almost impossible to get to Panichishte from Sofia during autumn. Can you please give us a little advice? Can I having a month-student card take a big suitcase with me or do I need an extra ticket for that? Thank you! Hello, Jane B! No, you don’t need extra ticket. Hello from israel. I have a student card. Does it help me to get low cost on public transportation or in the museons? The ISIC will also give you discounted prices at most of the places like museums, galleries, etc. ISIC is the only international student card recognized and accepted in Bulgaria. Hi! Where can I buy a monthly card for all means of transport? Hi. can you tell me if its possible to buy the 3 day pass at the airport please? Hi there! Yes, it is possible to do that at both terminals. Enjoy your trip to Sofia! Hello, are marshrutkas part of the public transport system? If I buy a 1-day or 3-day card, is it valid for the marshrutkas or do I buy the ticket in them each time? Thank you very much! Hi Iva! Marshrutkas are NOT part of the public transport system. Therefore, you need to buy the ticket from the driver each time you hop on on one.